How would one go about boosting only the blues, specifically for the sky map texture to have a more saturated blue sky? Without saturating other colours. I can't find a solution in the SweetFX shaders so maybe one of the other shaders in the new v1.00 release will be able to do this? Vibrance in the blue channel hardly affects skymaps, it mostly affects dirty brown colours. Colour Matrix can make richer blues but it changes the actual colours. Last Edit: 3 years 8 months ago by RAmbO. LiftGammaGain in sweetfx should let you mod just the blue channel, it lets you do low/mids/highs also so you might have enough control with it to do what you want. Tried Lift Gamma Gain. It didn't saturate the blues, just tinted the image. As far as i know, none of the current shaders let you apply vibrance/saturation to 1 specific texture. If the game allows depth buffer access, you might try GemFX bloom with depth-based setting turned on. The bloom will automatically enable if you turn on chapman lens or ambient light shader in GemFX (i dont think it has an on-off setting, it's just connected to the other shaders in the suite). I would mess with the bloom saturation (but you may end up tinting the whole picture). You might be able to get it to do what you want, but no promises. There are a ton of settings in GemFX and many of them will tint the whole picture (which is the problem you seem to be having). I prefer to let the ambient light hit the whole picture anyway because it can look amazing, but that's just me. Anything RGB based cannot do what you want as it will boost the blue channel and therefore change all colors. What you want is boosting the blue channel where it's already very intensive, easiest way is a HSV based color grading so where the hue is blue, increase saturation. I have a big HSV color grading on hold somewhere that can adjust exposure, gamma and saturation for magenta, indigo and so on but a LUT texture edited in photoshop accordingly should do the job. Hi Rambo - have you tried to make LUT yet? 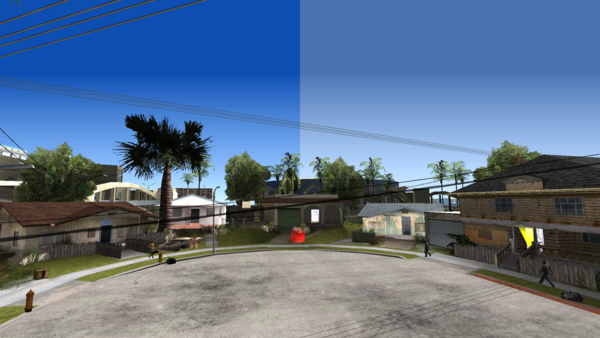 The Sky in your game has maybe a stable blue color range - so you could affect that range with a custom LUT. You can do these in Photoshop or freeware pendants as well. This customized area of blue would of course also be used for similar blue´s in non sky regions in the game if they share the same color space possibly. Last Edit: 3 years 7 months ago by Solano. Rambo: I suppose you look for something like this? I'm gonna pass the HSV Equalizer to LuciferHawk so I guess in the next update of the Framework it will be included. That looks incredible and is exactly what I'm looking for. Can't wait for it.